I am at both an advantage and disadvantage when it comes to the remake of The Stepfather. I have never seen the original, so I cannot compare one with the other. I also have never seen Nip/Tuck or Gossip Girl, so I cannot gauge how different the characterizations of Dylan Walsh and Penn Badgley are to their characters on those shows. That being the case, I enter The Stepfather with clean eyes. I leave The Stepfather wondering why the film didn't try to do better. 'Dan Harris' (Walsh) comes to Portland, apparently to start a new life after the death of his wife and daughter. He meets Susan Harding (Sela Ward) at a grocery store, and six months later they are engaged. It must be summer, because Susan's troubled eldest son Michael (Badgley) returns from military school, sent there for the vaguest of reasons. Greeting him is his girlfriend Kelly (Amber Heard), along with his siblings Sean and Beth (Braeden Demasters and Skyler Samuels). Michael isn't too warm towards Dan, but must accept that he will be his stepfather even though relations with his actual father Jay (Jon Tenney) are also strained. Things appear to be going well, but there are a few things off about Dan. He travels a lot on business but when he gets a good job as a real estate agent courtesy of Susan's sister Leah (Sherri Springfield), or is her sister Jackie (Paige Turco) (since they were a lesbian couple I could never remember which one was the 'blood' aunt and which was the 'partner' aunt), he quits rather than submit information such as a photo ID or Social Security, let alone be photographed. Also, a neighbor tells Susan a man who looks like Dan appeared on America's Most Wanted. Only Michael suspects anything is off, but we already know from the beginning what it is: Dan Harris is a serial killer who has already killed at least one family and is looking for a new home to slaughter. I would argue that The Stepfather is actually a misnomer because Dan and Susan are only engaged and never get around to getting married, but perhaps I'm being a bit technical on a film like this. I would also argue that director Nelson McCormick and screenwriter J.S. Cardone don't trust their audience. This comes from the fact that there is no mystery as to what Dan Harris is: we open The Stepfather with him calmly leaving a home and looking around at the bodies of the wife and kiddies he's dispatched. Maybe it was a way to create tension because the audience knows that Dan is going to make an effort to kill the Hardings, but for me, it didn't leave any room for doubt. Instead, in a rather by-the-book style, you were calmly waiting for Dan to give the killing a try. I once argued that in many comedies, you had to rely on a certain level of stupidity from the characters to have the plot move forward. I should have expanded that to some thrillers as well. Most embarassing is how stupid Susan is. She is told by a neighbor that Dan looks like someone on America's Most Wanted, and a few days later said neighbor is found dead, but she never for one moment thinks to possibly connect the two incidents. She casually dismisses her sister's doubts about how he doesn't want to turn in basic information that would have been asked at the beginning of his job. She never seems the least bit curious that Dan doesn't have any photos of his late wife or child. It isn't just Susan who is bizarrely dumb. If Mrs. Cutter (Nancy Linehan Charles) truly does suspect that Dan Harris is some sort of criminal, why doesn't she call A.M.W.? Why would Jay, already suspicious of Dan after Sean tells him Dan nearly chocked him off-camera, start to tell Dan about his doubts instead of Michael? If Michael suspects something is up with Dan, especially after overhearing the conversation between Mrs. Cutter and his mother, why can't he do a little digging? I figure this is because if any of them did anything ration, you wouldn't have a film. Most curiously, for being some sort of master serial killer Dan is quite clumsy. For example, he dispatches Jay but apparently never stops to wonder that if Jay doesn't make his flight or get back to whatever job he has, the police won't try to investigate his disappearance. He can't get the name of his 'daughter' right, but this only leads to anger at himself, not any worry that Michael may suspect something's off. You'd think this was the first time Dan has tried killing anybody, not his maybe third. All this might be overlooked, but not some terrible cliches. The Stepfather ends in what is suppose to be a dramatic confrontation between Dan and Michael, with Susan and Kelly watching from the sidelines in terror. Did they really have to have a big rainstorm during this confrontation? Why, oh why do people run upstairs when being chased by serial killers when one would think the flight or fight response would have them run out of the house? How is it that when two people fall off a two-story house, one of them ends up in a coma for a month and another escapes with nary a scratch? Worse, in this 'great confrontation' between Dan and Michael, when we think Dan might be dead, McCormick steals shamelessly from Psycho (hint: it involves shower curtains). My eyes rolled in irritation at this point, but then, in 'thrillers' like these, you know Dan can't be dispatched so easily. Side note: speaking of showers, we were treated to nearly endless shots of Michael shirtless, usually by the poolside, and while it's nice to see Badgley takes good care of himself, the shots had passed the border of gratuitous to where one would think he was trying out for Jacob Black's far-skinnier cousin. The characters were so underdeveloped. We never got a reason as to why Dan was a serial killer: was he motivated by a hatred of families, a pathological thrill from killing, or what? Same goes for Michael: we know he was sent away to military school because he was 'troubled', but we never got an idea of what exactly he did that was so troubling, especially since during this summer he didn't seem to do anything out of the ordinary of a teenager during summer break, namely eat, sleep, and make out with his girlfriend. He's suppose to be a good swimmer, but once Dan gets him to join his old high school team's swim team during the summer on a probationary trial, we never actually see Michael go to school to swim. Those types of plot points left dangling are things that frustrate. I think Walsh really enjoyed being evil. It comes out in his performance where Dan's menace does come through. He isn't over-the-top, but you always sense that whenever he's trying to be charming, he is being insincere. Overall, it was a better performance than The Stepfather deserves. I have always thought it was a crime that Sela Ward is not as big a star as her talent and beauty should have made her. It's always good to see her in any movie, but one wonders if she really is too smart a person and actress to make Susan so incredibly dumb. Badgley didn't break ground in this film. He looked like any slightly sullen twenty-two year old; oddly, he did look a little too old to be a teenager, but that's a minor point. His performance consisted mostly of making faces and being shirtless, which perhaps might be his primary method on Gossip Girl though granted, I have never seen the show, but beyond that there was no characterization here: then again, there wasn't much of a character either. Side note: I counted a total of five shirtless scenes, putting Badgley one short of Taylor Lautner in Eclipse. Tenney gave a short but wonderful performance as the biological father, which would have worked wonders if The Stepfather had been a straight drama but which looked slightly out of place in a slasher film like this one. However, the genuine concern for his children at the hands of Dan did leave a realistic impression, a hallmark of good acting. 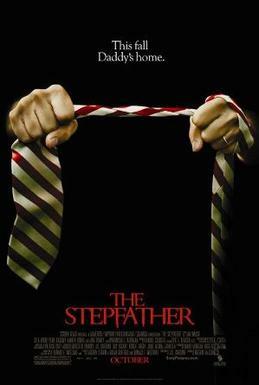 Strangely, I think I would have enjoyed The Stepfather better if the film were a drama. Even if they had decided to go for the thriller aspects, the film would have improved if a few changes were made: giving Dan some motivation for his crimes, not letting us know from the top that he was a killer, making Susan a little more hesitant or have her grow a little suspicious of her perfect man, giving Michael a more clear reason to be hostile. I'm guessing the divorce may have affected him, but given his underused siblings didn't appear too troubled, one wonders what really was his problem. As dumb, standard slasher movies go, I suppose The Stepfather will fulfill all the requirements if one doesn't want to think while watching. It might even have been a shamelessly good time with a bad movie, if it weren't for a totally ludicrous ending which violates one of my Golden Rules of Filmmaking: Never End Your Movie By Suggesting There Will Be A Sequel. That being the case, The Stepfather will never be accepted as the real thing.